Can you tell the them of last week’s menu items yet? Yes, it’s lime and cilantro…again. I did, however, make this delicious cauliflower the same night I made the chicken thighs so this dish complemented my meal very well. 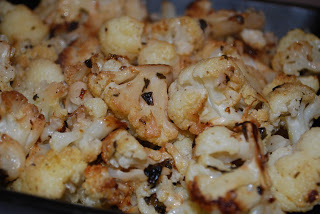 I love roasting cauliflower, it gives it such a great flavor and for me, allows me to eat it as I won’t any other way! Add all ingredients in to a bowl and mix well until all of the cauliflower has been coated. Place in a 9″x9″ baking dish and bake at 400°F for 45 minutes, turning occasionally. Serves 6. This looks delicious! I love roasted cauliflower, and I really like your twist with cilantro and lime.